Curamin, which gets its name from curcumin, is a supplement that is derived from turmeric. Used in the Ayurvedic tradition to support relief from muscle and joint pain, curcumin is also used to support recovery after physical activity. 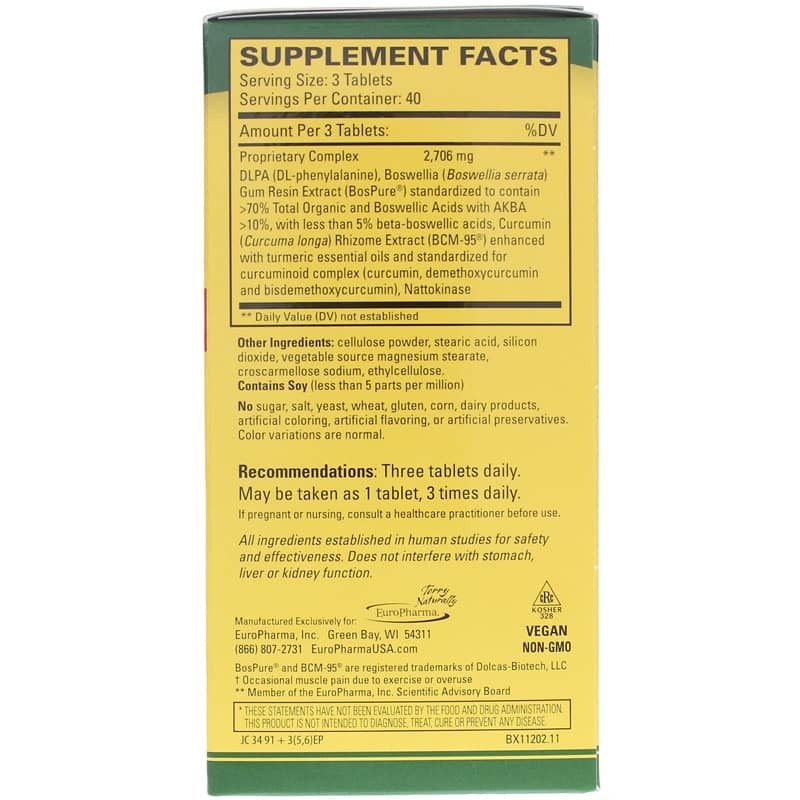 Curamin Extra Strength from Terry Naturally supports your body's internal responses, and unlike typical curcumin supplements, Curamin contains BCM-95 curcumin, which is specifically designed to more easily absorb into your system. 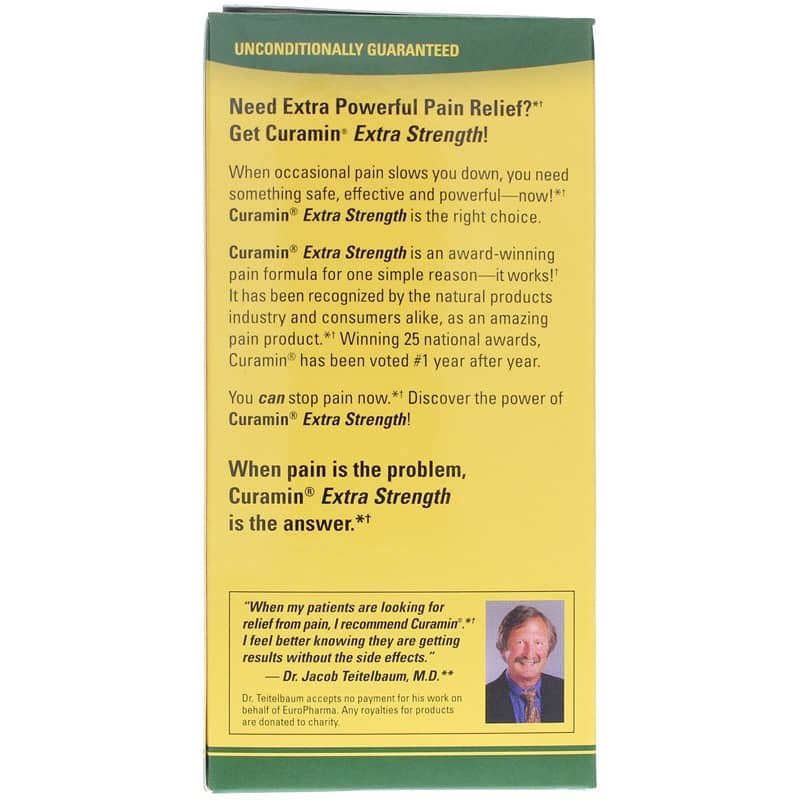 According to a recent study, Curamin also displayed superior results on pain relief. This supplement also contains BosPure® a studied form of boswellia known for the potential to help the human body balance its natural responses, and DLPA, which could support positive effects on endorphins. Curamin Extra Strength from Terry Naturally supports temporary relief from occassional muscle and joint pain, and may make a difference to your health. Order yours online today! Contains soy (less than 5 parts per million). Contains NO: sugar, salt, yeast, wheat, gluten, corn, dairy products, artificial coloring, artificial flavoring, or artificial preservatives. Color variations are normal. Vegan and Non-GMO. Kosher. Adults: Three tablets daily. May take as 1 tablet 3 times daily, or as needed. for prompt accurate service at a competive price you can not beat this firm. Great people and service. Curamin Extra Strength is helping my problem immensely. I can't take NSAIDs and Curamin seems to help my knee. My husband hurt his back and nothing helped like this. Curamin Extra Strength works. He does not miss a day taking it. Life saver! Curamin Extra Strength really helps. I can take one up to 3x per day, and it really helps. 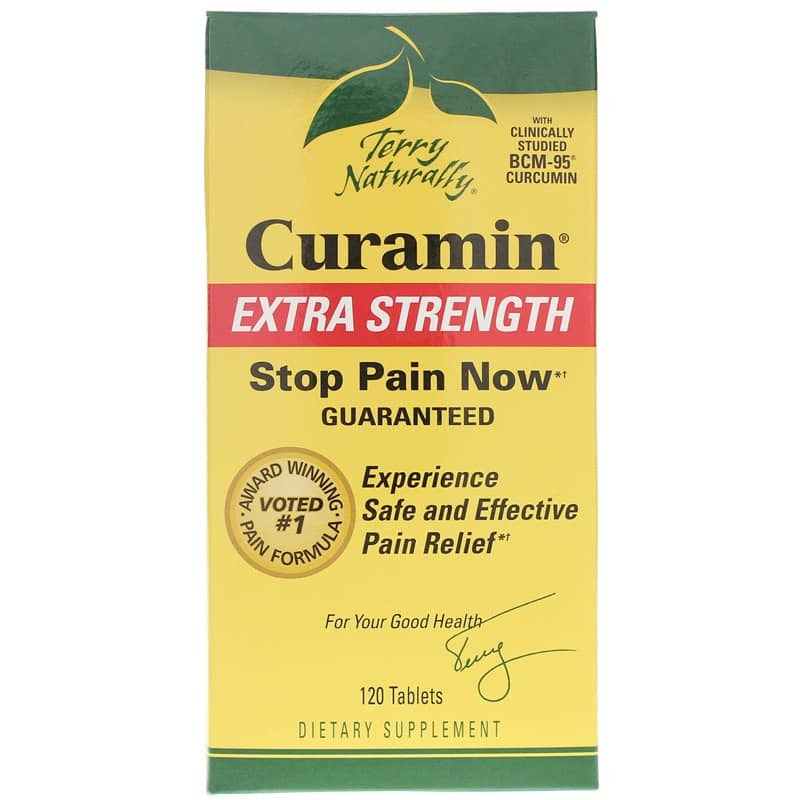 At first I thought I would just give Curamin Extra Strength - Terry Naturally - a try because Health Food Guru recommended it. I started taking it and realized it worked for me. 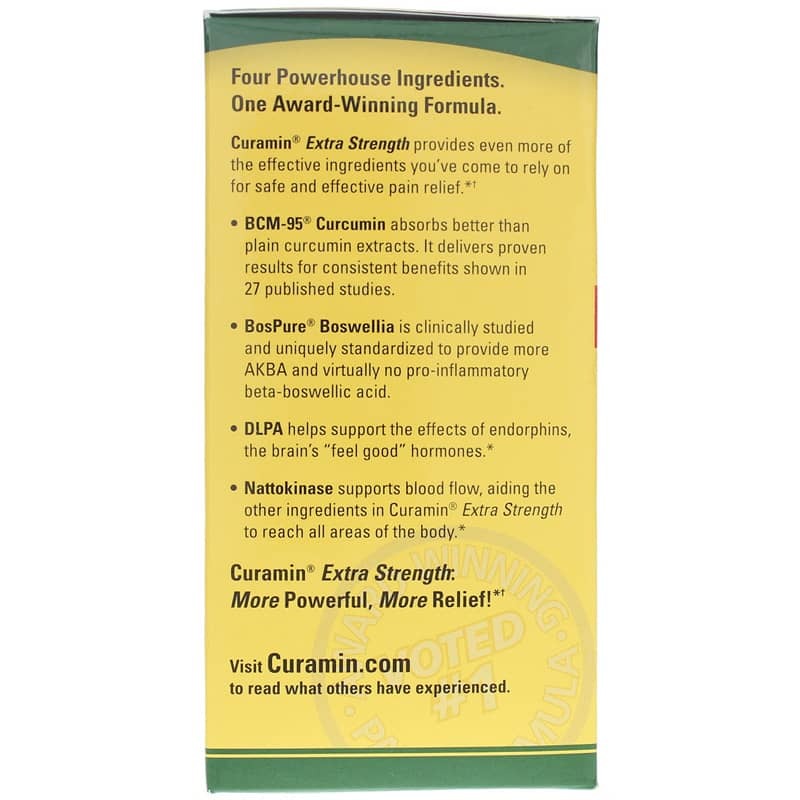 Curamin Extra Strength is the first non-prescription formula that works for me. This is one of the best products I have ever used and I highly recommend to use this instead of toxic over-the- counter medications that only mask the problem. I started taking Curamin a month ago. The Curamin effect was immediate but over time the effect is just short of a miracle. I can honestly say Curamin has given me my life back. Amazing - Curamin Extra Strength by Terry Naturally really helps! Not just for one day either. So nice! Thank you. A friend recommended this product. I faithfully took it twice a day for two weeks. This product is expensive and a waste of money. Acupuncturist recommended Curamin Extra Strength, 3 a day for awhile. Both my wife and I took it. Worked wonders. Down to one pill a day and still working fine. Wish it were a little less expensive, but Naturally Healthy Concepts had the best price we could find. Curamin Extra Strength works great. I had to give up my horseback riding...it has been sad. After looking for two years and purchasing a meriad of supplements, I found this product that helps and I ride again. THANKYOU CURAMIN. Curamin Extra Strength was wonderful in aiding my husband. My chiropractor told me about this product. I bought it and had great results. I ran out and bought a less expensive brand of curcumin and it did nothing. Well worth the money. Will not buy anything else. Just so pleased with how I feel now that I take this on a regular basis . A noticeable difference. My sister recommended this to me so thankful!! Price and fast shipping was also an added bonus to my purchase ! I am on my second month of using Curamin and am not so sure it has changed anything for me. So....don't know if I will continue to use this product. I use Curamin Extra Strength by Terry Naturally! NHC has the best prices for Curamin Extra Strength that I have found anywhere. The order arrived promptly, and the website was easy to navigate. What more could a customer ask for? Curamin Extra Strength helps. Amazing stuff!!! !